Starting your second business with a newborn and recently having moved to a new country, is no mean feat. That’s just one of the reasons why we’re so impressed with this super mama. 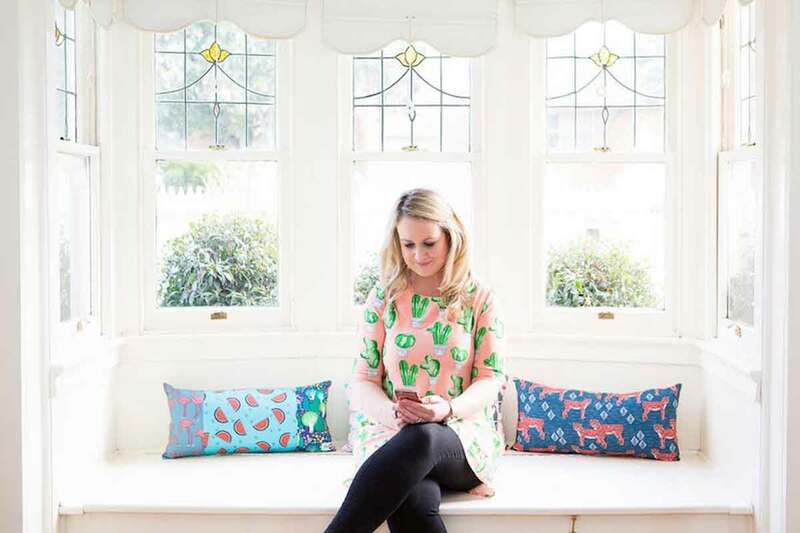 Meet Lucy Green, the creator behind online baby boutique directory, Baby Berry Collective. Lucy’s career has taken her to different countries and her roles have been diverse and colourful. In fact, we’re a tiny bit envious of her CV! This mum of two shares with us why she started the successful Baby Berry Collective, and how slowing down and focusing on the little things, are what’s really important. After completing my Bachelor of Business Studies in NZ, I wanted to try out management within the retail field. It was fashion and I loved it. It gave me a brilliant understanding of customer service, sales and managing a team. I started in NZ and was lucky enough to have a trip across to manage a couple of Melbourne stores too. After that, I took a year and taught English in South Korea. It was an incredible experience and one that I’m so pleased I did! The next part of my career was working in Senior Financial Recruitment in England. Based out in Windsor (where I often saw the Queen!) I loved working within a new area and working with some major FTSE 250 businesses. Five years later I decided it was time to head home to NZ and made the decision to start my own business with my sister. We started a design company called Cocoa Berry Design and we created wedding stationery for wonderful couples in and around NZ. The next move was across to Melbourne (as my husband had landed a terrific job) and we decided to start our family. While at home with my first born, I created my business Baby Berry Collective. Can you tell about your motivation to start Baby Berry Collective? While being at home with my son here in Melbourne and being a New Zealander, I realised I didn’t know anything about any of the small, boutique baby businesses. I had no idea where to shop for those unique, different products for babies. I only knew of the main big brands but really wanted to see what delights the smaller businesses had to offer. I knew I wanted to start my own company again, so I came up with the idea of creating an online directory consisting of boutique baby and children’s businesses in Australia and also NZ. I wanted it to be a place where other new mums could come to discover small brands and find helpful information to inspire them on their journey through parenthood with the blog pieces written by specialists on the site. You have two gorgeous children who are three and five. Having children can really affect your sense of self. How did you find the transition into motherhood? I’ve enjoyed the transition into motherhood. Like most new mums, you never really know what to expect. It’s taught me so many things. Patience being a major factor. Plus slowing things down and allowing myself to go at a speed that suits me and my family. In terms of finding ‘me’ time, that’s something I’ve been working on. I get the odd pocket of time here and there, but truth be told, it’s not much. I really need to make sure I carve out time in advance because we don’t have any family here. So if it’s not me looking after our children, it’s my husband. We don’t have anyone else (my husband is English so his family aren’t here either). Not having any family over here is tough at times. When your children get sick or more so, when you get sick, that’s when you realise you need help but don’t actually have any. Somehow we’ve survived the first five years and now that my children are that little bit older, it’s getting easier. Has it become easier or harder now that your eldest has started school? The first few weeks were mainly about us finding our new routine. Now that we’ve found our groove, I’m finding it easier in the sense that I know exactly what my working hours need to be. I’ve always been a fairly routine based person (you get that when you come from a military family). But it’s all new for the kids. Having to be up and out the door at a certain time EVERY day is quite different to when you’re just at kindergarten a couple of days a week. Without a shadow of a doubt, it’s watching my children learn and discover new things, the excited look they get on their faces gets me every time. It’s made me slow down and really enjoy the small things. Before kids I’d work at a million miles per hour. Now, on the days when I’m at home with the kids, I like to take it slow and spend quality time with them. I love being able to go out to the zoo, the museum, the park, Scienceworks, Bounce. I just love to see them having fun and smiling. I’m a lot more patient than I used to be. Every parent will know what that’s like I’m sure! I’ve always been a family person, I’m super close to my family who live in NZ and now having my own family, I realise even more how incredibly important family is. It means everything to me. What’s the one thing you would tell your younger self? Read more books. It’s something that I don’t get a chance to do at the moment. Maybe that will change later down the track, but right now, I’m either working or with my children. Favourite time of the day is… when my kids run to kiss and cuddle their dad when he gets home from work – they get SO excited to see him and it’s makes my heart sing! Instagram sites that inspire you… @wellnourished (healthy eating & recipes) @thedigitalpicnic (all things social media), @emilyspicerstuart (business coach), @happyhandshappyheart (playdough queen who always has such positive, wonderful messages). I’m happiest when… I’m with our whole extended family in NZ at our holiday house by the lake. It means my children get to play with their cousins. This is my happy place. Only really happens once a year, but gosh I look forward to it! I’m addicted to… my phone. Wish it wasn’t true, but it is. Ah, the life of a small business owner! Favourite wardrobe staple for work… denim skirt and a tee is my go to. Favourite wardrobe staple for weekend… is dresses, any kind of dress! I do love Gorman, Harvest Lane, Miranda Murphy, Decjuba and Blossom & Glow – some of my favs. My role models are… my mother and father. Heels or flats? Flats. I wore heels for years and years and then after I had children, never again!